Considering tomorrow is the first day of March, I thought of the saying in like a lion and out like a lamb” and wondered if it pertained to the chilly weather we’re experiencing. According to the omniscient Wikipedia, “inlike a lion and out like a lamb” is an English proverb that describes typical March weather and in the 19th century it was used as a prediction contingent on early March weather. If March comes in like a lion, it will go out like a lamb – but it was recognized to not work very well 🙂 Fortunately, the U.S. is at a lower latitude than our brethren across the pond, so we hope it holds true! Not only does the gentle lamb represent Spring in weather phrases, it’s also a harbinger of spring in the kitchen. The February issue of Bon Appétit featured braised Lamb Shanks with Swiss Chard to get us through the lion days of March, then lamb stews for St. Patrick’s day, and April issues will feature an abundance of grilled and roasted lamb recipes to celebrate Easter and Passover. My palate acts as a weather barometer and has been craving lamb, so while I’m looking for the perfect lamb stew recipe for St. Patty’s, these fabulous and easy grilled lamb kebabs will do just fine! 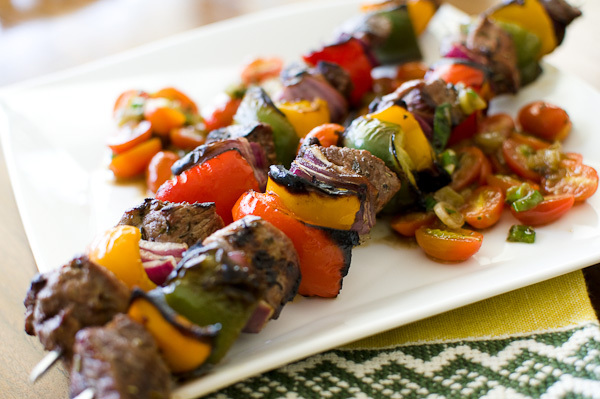 Whatever the name: brochettes, kebabs, kabobs, skewers - mixed with colorful peppers and onion they are a delicious alternative to steak, chicken, or ribs for spring or summer grilling. Place lamb in a glass baking dish, sprinkle with salt and pepper. Whisk together the lemon juice, grated lemon peel, olive oil, Herbes de Provence seasoning. Pour over lamb, toss to coat. Let mixture stand for 10 minutes, stirring occasionally to blend. Using slotted spoon, remove lamb from marinade. Add vegetables to marinade and toss to coat. 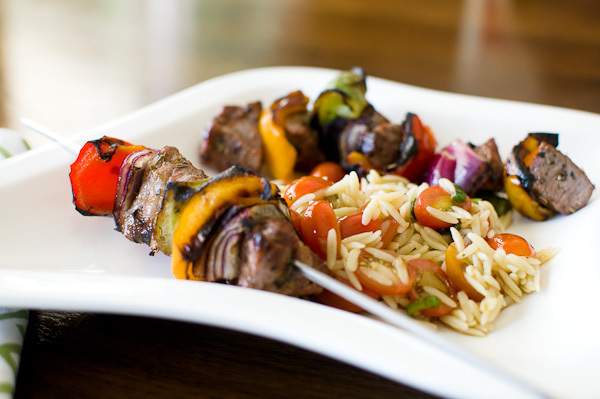 Thread lamb, with onion, and bell pepper pieces alternately on six metal skewers. Grill until onion and peppers are slightly charred and lamb is cooked to desired doneness, turning and brushing once with marinade, about 12 minutes for medium. Shown here with a salsa of halved grape tomatoes mixed with sliced green onions and green chilies in olive oil mixed with orzo. I am SO ready for spring! I actually wore my flip flops yesterday, a bit cold but I am ready for spring and summer. Your lamb kebabs just scream spring and look SO incredibly tasty! Have a great week! These kebabs sound awesome! Love the three different colors of pepper here, gorgeous! Beautiful and so ready for spring!! It was close 80 yesterday and now dropped 30 degrees…??? This totally brings the feeling of spring back. lovely photo, i just love lamb kebabs… soooo ready for spring, i hate this cold- i’m a big baby! Great job! they look succulent! I’ll say stunning photos. I’m want spring too, I’m still cold to go turn my grill on. Hopefully in a week or two. I want some lam kebabs. Hope you have a great week. First, I love lamb so this recipe is right up my alley. Second, YES, I am dying for spring…dying, I tell you! I love lamb and I’ve actually been craving it lately. Must be the yearning for my Spring-like weather. I can’t remember the last time I had lamb kebabs but now I want some, especially with all of those grilled veggies! I love the way you prepared this, Priscilla. Beautiful marinade. I’m with you – my taste buds also know that it’s time for lamb. Send them over..I am ready for Spring!!! It looks so delicious and colorful! I have never made lamb at home before….well I guess “cooked” is a better word. After seeing your recipe, I can’t wait to try my hand at it! I hope you have a wonderful day tomorrow. Thank you for sharing another bite of delicious goodness! Yummy! It does look like spring ;)can’t wait! I’m reading your blog and looking out my window at snow. Sigh. I’m going to use your recipe but roast the ingredients in a very hot oven, as my grill doesn’t cook very well in temperatures below freezing…. Come on Spring! Kebabs on the grill are one of my favorite meals. Usually have beef or chicken, but this lamb looks yummy. Great pics, great recipe. Congratulations on top 9 this morning, your photos are beautiful and the lamb kebabs look delicious;-) I see Spring all around but rain all week, yuck, ready for sunshine. Thanks everyone! We’re all ready for spring and some colorful kebabs 🙂 Roasting definitely works if its too cold to grill! Congrats on the Top 9 Priscilla! I’m so ready for Spring! The kabob looks so delicious. Whether it’s spring or not I’m always ready for a kebab and lamb is a meat that I truly love. Great pictures! They are so bright and colorful! The colors do you look great! It’s time for spring to really make itself known because we’re all ready for the grill and the kabobs that need to go on it. Definitely ready for spring! 70 degrees one day, 55 the next. Ready to fire up the grill and let the kebabs hit the fire! i am just drooling over this dish! i love eating kebabs 🙂 and this looks fantastic! thank you for sharing this. We celebrate the first day of spring with friends every year and this will definitely be on the menu! I forgot about lamb…My turn to cook the family meal on Sunday and father-in-law req. kebabs. I wanted to try something different. This could fit that bill. Glad I followed the link From Sandra’s guest post over to your site.